Located only blocks from Tokyo's glittering Ginza, Tsukiji—the world's largest marketplace for seafood—is a prominent landmark, well known but little understood by most Tokyoites: a supplier for countless fishmongers and sushi chefs, and a popular and fascinating destination for foreign tourists. Early every morning, the worlds of hi-tech and pre-tech trade noisily converge as tens of thousands of tons of seafood from every ocean of the world quickly change hands in Tsukiji's auctions and in the marketplace's hundreds of tiny stalls. 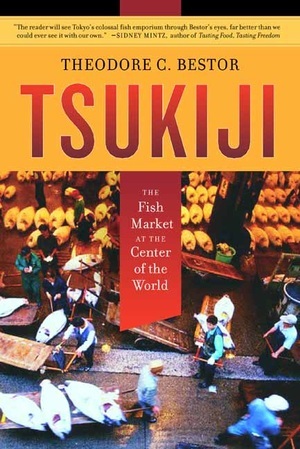 In this absorbing firsthand study, Theodore C. Bestor—who has spent a dozen years doing fieldwork at fish markets and fishing ports in Japan, North America, Korea, and Europe—explains the complex social institutions that organize Tsukiji's auctions and the supply lines leading to and from them and illuminates trends of Japan's economic growth, changes in distribution and consumption, and the increasing globalization of the seafood trade. As he brings to life the sights and sounds of the marketplace, he reveals Tsukiji's rich internal culture, its place in Japanese cuisine, and the mercantile traditions that have shaped the marketplace since the early seventeenth century. Theodore C. Bestor is Professor of Anthropology and Japanese Studies at Harvard University and past President of the American Anthropological Association's East Asian Studies Section and the Society for Urban Anthropology. His publications include Neighborhood Tokyo (1989), Doing Fieldwork in Japan (coeditor, 2003), and "How Sushi Went Global" in Foreign Policy (2000).